Memories of Jammu and Kashmir flood and Uttarakhand landslides are yet to fade away from our minds. We can hardly take any measure against natural perils but we can at least minimize the after-effect of such untoward incidents by insuring our residences. A home insurance plan can not only provide shield against damages caused to the house but it also protects valuable household items. Home insurance policies are chiefly of two types. First type of policy offers coverage for only the home structure and the second type covers both home building and the precious household items. When you look for a home structure cover you need to understand three key aspects first. The aspects are sum insured amount, coverage and tenure of the policy. Let's start with sum insured as you need to comprehend how this amount for a home building cover is determined. Calculation of sum insured amount for a home building insurance plan The sum insured amount is usually calculated in three different ways. A detailed discussion on all these three ways will help you understand how sum insured amount is measured. Reinstatement value The most common practice is determining the reinstatement value of the residence structure. In this method, insurance houses provide the cost of construction of house without including the land value. A simpler example will assist you understand this method clearly. Suppose, you want to insure your residence structure. The area of your residence is 2,000 sq.ft. And it is 10 years old. The value of house is Rs. 60 lakh (considering Rs. 3000 for each sq. ft.). The construction cost is Rs. 40 lakh ( considering Rs. 2,000 for each sq. ft.). The sum insured amount is determined by multiplying the total area of the house with the cost of construction for every sq. ft. Hence, the final reinstatement value will be 2000 x 2000 = Rs. 40 lakh. Indemnity value This type of valuation is calculated by subtracting the depreciation value which is determined in terms of the age of the house from the construction cost. Again, an example will make things clearer. Suppose, the age, construction cost, value of the land of your house are the same as in the previous example. The construction cost of your house is Rs. 40 lakh. Considering 25% depreciation, the depreciation value is Rs. 10 lakh. So, the indemnity value of sum insured will be Rs. 30 lakh (Rs. 40 lakh minus Rs. 10 lakh). Agreed value The third and the last method is known as agreed value and it involves land value and cost of construction. Let us resort to our previous model of example to make this concept easily comprehensible. The sum insured amount is measured by multiplying the entire house area with construction cost of the house per sq. ft. The sum insured amount will be 2,000 x 3,000 = Rs.60 lakh. The indemnity value and the reinstatement value are more frequently used to calculate the amount of sum insured than the agreed value method. If you want to choose this method of determining sum insured amount Bajaj Allianz General Insurance is your way to go as this insurer offers home insurance plans on the basis of agreed value. Should you go for terrorism and earthquake coverage in your plan? Now that you have got a clear idea about how sum insured amount is determined the next thing you need to consider is the coverage aspect of a home insurance plan. Though, it is optional but you can include earthquake and terrorism coverage by paying an additional amount on premium. You need to figure out how much extra you have to pay if you choose coverage for terrorism and earthquake. If the difference of amount is nominal it is wiser to go for such additional coverages. Let's compare both of these scenarios so that you can easily determine the difference in premium amount. Premium amount without earthquake and terrorism coverage If you want to insure your house structure without terrorism and earthquake coverage for 1 year and for a sum insured of Rs. 50 lakh, you can choose from 3 different insurance plans. The premium amount varies roughly between Rs. 2,200 and Rs. 2,800 if you don't want coverage for earthquake and terrorism. Premium amount with earthquake and terrorism coverage But if you want to have these coverage included in your home insurance plan premium amounts will differ. In that case also, you have to select from 3 home policies. And the premium amount varies roughly between Rs. 3,300 and Rs. 3,600. So, you just have to pay an additional amount in the range of Rs. 800 to Rs. 1,200 annually on premium in case you want to have terrorism and earthquake coverage included in your home policy. Since the difference of premium amount is insignificant, selection of a home plan with terrorism and earthquake coverage will be a sensible decision. Another important facet of a home insurance plan is the tenure. Insurance providers allow policy buyers to choose various terms as per their convenience and requirements. You can choose between 1 and 15 years while buying a home insurance plan. The most crucial thing that you should know before selecting the tenure of your home policy is there is discount on offer if you go for multi-year home policy. The discount rate rises as you increase the number of years of policy term. 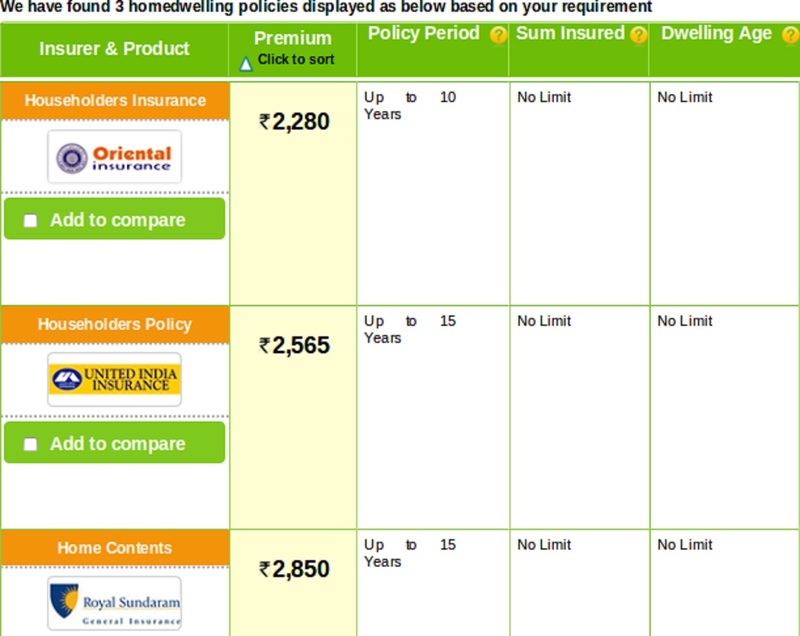 If you select 5 years term for your home insurance policy keeping rest of the criteria same (sum insured amount Rs. 50 lakh and with earthquake and terrorism coverage) you will get 3 different quotes for home cover. The lowest premium amount is Rs. 13,538. If you select this policy with lowest premium and renew it for another 5 years. The total payable premium amount after 10 years will be Rs. 13,538 x 2 = Rs. 27,076(considering the sum insured amount remains the same). If you select 10 years term for your home insurance policy keeping rest of the criteria same (sum insured amount Rs. 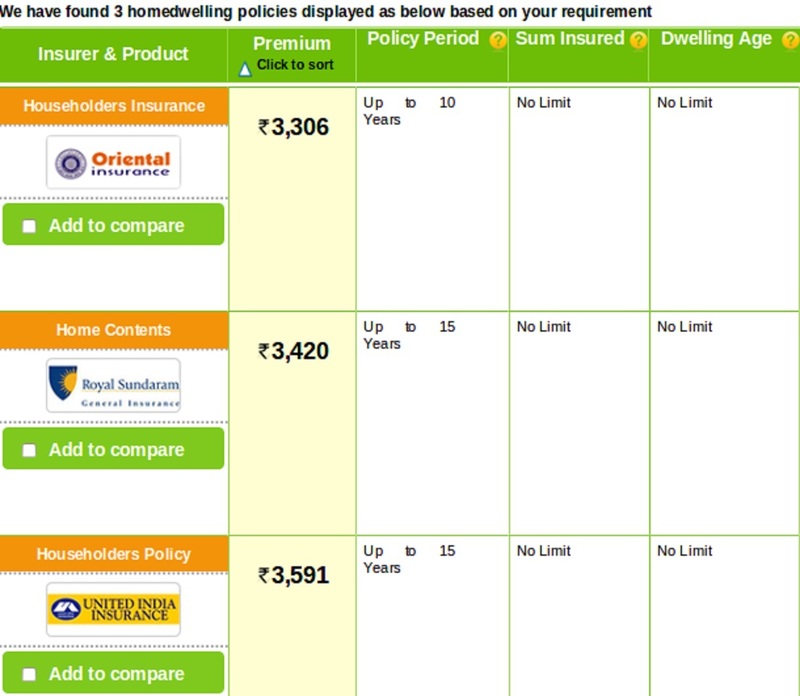 50 lakh and with earthquake and terrorism coverage) you will again get 3 different quotes for a home policy. The lowest premium amount is Rs. 19,950. 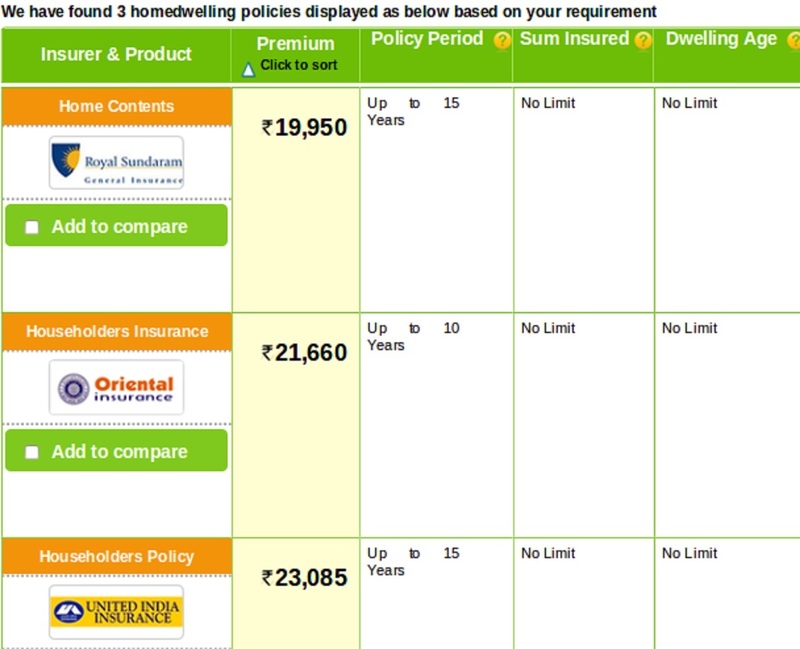 If you select 10 years term for your home policy you can save Rs. 7126 (Rs. 27,076 – Rs. 19,950) on premium amount. Since you invested the the biggest chunk from your savings in buying or building your residence it is your one of the costliest assets. An expensive property like this should be taken good care of. The best way of caring your home is by availing a home insurance policy. Hopefully, the detailed discussion on vital aspects of a home cover will help you steer clear of those deals that are not advantageous and pick up the the plan which is beneficial in all aspects. To get the best Home Insurance bargain in India, call us now at 1800-258-2584 (Toll Free) .